Emergency and exit lighting are crucial components of any evacuation plan and a necessary link to safe escape when a fire or other hazard occurs at your Greenville area workplace. At State Systems Inc., we take your safety seriously and urge customers to have our certified technicians professionally install and also perform regular inspection of both their emergency lighting and exit lighting. We have the experience and knowledge to ensure your emergency and exit lighting system works properly when you need it most. For installation or inspection services in Greenville, call State Systems, Inc. at 866-308-5701. Emergency lighting should be a component of your fire protection plan to save lives and property in the event of an emergency in your office building. During serious power outage situations, emergency lighting illuminates all exit passages–including corridors, stairwells, ramps and escalators. 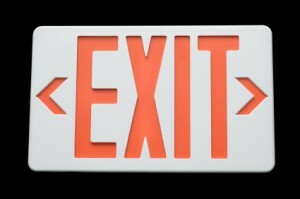 Exit lighting also helps by pointing the way to a safe exit. If your property needs emergency or exit lighting installed or replaced in Greenville, MS, contact us today for an estimate! Our fire protection technicians can design a lighting system that will allow for a safe exit for your employees in case of an emergency situation. In an emergency situation, your employees can become disoriented and overall safety can be compromised if either the emergency or exit lighting fails to activate. Don’t take the components of your emergency and exit lighting system for granted. Let State Systems, Inc. check your batteries, charging systems and bulbs to ensure you’re prepared. To help you out, we keep up with all maintenance and records of inspections so you don’t have to. The National Fire Protection Association (NFPA) 101 Life Safety Code requires that all industrial emergency lighting and exit lighting devices be inspected monthly and tested annually. All of our licensed technicians at State Systems, Inc. understand the major components and criteria established by NFPA 101, which aims to protect employees in the case of a disaster. State Systems, Inc. is here to serve your Greenville company’s fire protection needs. To learn more about our emergency and exit lighting inspection services offered throughout Greenville, or for a quote, contact us or call 866-308-5701.